The ancient weir on the River Brue in the village of West Lydford has just been repaired by a group of local volunteers after 3 years of fundraising. 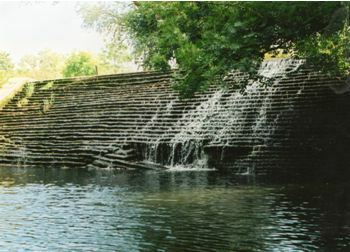 The weir, which is the largest on the Brue, had suffered severe erosion damage in the latter part of last century and was in danger of collapse. In September 2010, the Lydford Weir Company, a charity, was formed to effect the repair. The target was £60,000 and funds were raised from running local events, generous personal donations from members of the local community plus a major grant from Viridor Credits Environmental Company. The contractor was Suttle Projects Ltd of Swanage, Dorset. Given this summer’s very heavy rainfall, the repair was a big challenge as the river had to be diverted away from the weir and the plunge pool at the base, so that the repair work could be carried out. This was achieved by diverting as much of the river water as possible down the associated mill streams, then pumping and syphoning the remainder of the water over the weir area, to the river bed further downstream. The project was completed within time and cost constraints and those who contributed to the project will be/were invited to a recommissioning reception on 18 November in the village hall, close by the weir. A display board giving information about the weir and the repair, will be/was unveiled by local resident, Sir Conrad Heron, who undertook much of the early work into establishing ownership of the weir and the Restoration Project organisational set-up. 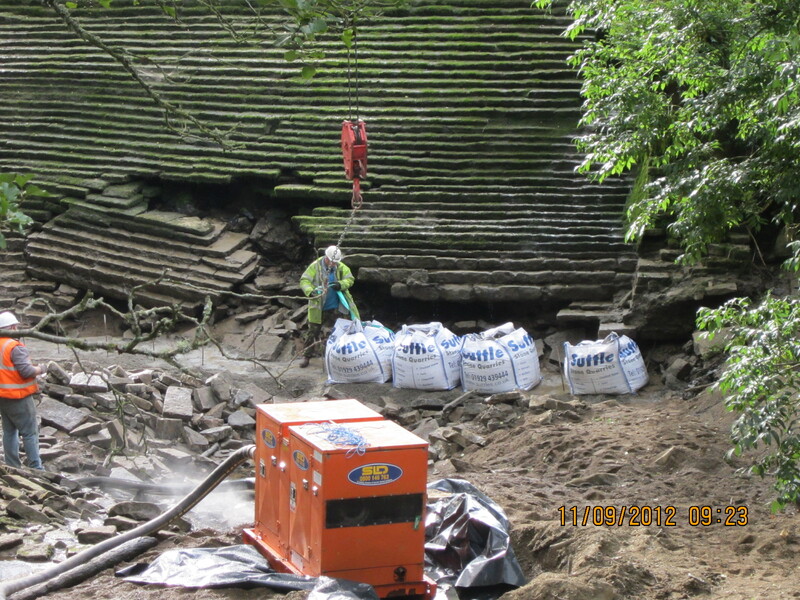 Work on repairing the weir has now started, and can be seen in these photos. The project needs your help though – head to the donations page to contribute. There’s some great photos of the mill stream over at Somerset Rivers. After bidding and bid evaluation, we have appointed Suttle Projects of Poole as the contractor. They have been to site with the Environmental Agency (EA) and agreed in principle the way forward. Suttle were waiting historical data on the weir from the EA, giving detailed survey data, a few weeks ago. The current plan is to undertake the physical repair works in July / August 2012. Discussions are in hand with Suttle and the EA on a two stage approach to the work. Part one being enough to secure the weir, and be within the current amount of money available. Part two being additional strenghtening to prolong the life of the weir, and not have to remobilise the contractor. The decision on whether part two will go ahead will be taken as late as possible, then knowing our funding position. Suttle and the EA are discussing the details of the site protection / preparation needed to minimise environmental impact during the works. There is to be a site meeting in the next couple of weeks to map out the detail of this and to initiate local action. We have initiated another round of fund raising, to raise the short fall required for part two of the works. Some applications have been made and the details of others are being gathered. The local fund raising events continue, with Charles Hazlewood giving his time for an event just before Christmas, this generated local press interest as well as raising over £1,000. A Burns Night was held last week. The local community members are still sending small donations by cheque. A communication giving news and saying thank you was posted in the local community areas. An all village meeting with presentation is planned for early April 2012. Notification of the award by Viridor Credits gratefully received, ENTRUST application went in, was registered and a signed copy returned. The Lydford Weir Company is now registered with companies house, has its own bank account, and the application to be registered as a charity is submitted. A web page; www.lydfordweir.org.uk has been created, and is being constantly updated and developed. The monthly steering group meetings continue, with smaller task specific meetings occurring more frequently. It is intended that photographs of work, and monthly meeting notes, be posted on the new lydfordweir web site. Monthly reports are given to the Lydford Parish Council. The earliest currently known records on this area are from the Anglo Saxon Chronicles; Lulla, Handmaiden to the Bishop of Glastonbury was gifted land at Lydford and elsewhere, in about 750AD. When the original weir was built across the river Brue is not yet know, but it is known that St Dunstan had work undertaken on the river, in the local area, arround 950AD. The earliest currently known record of the weir and leat is in the Doomsday Book of 1086 where a mill in Lydford is recorded. The current ‘King o Mill’, or as it was refered to at the time Kingham Mill, fed by the leat from the weir, was built arround 1600. The mill having the rights to the water flow and maintenance of this water flow. In 1840 the area was owned by the Coulston Family, and Reverend Coulston rebuilt the church by the weir, the bridge just upstream of the weir and the nearby rectory, he probably also paid for the weir repair at that time. 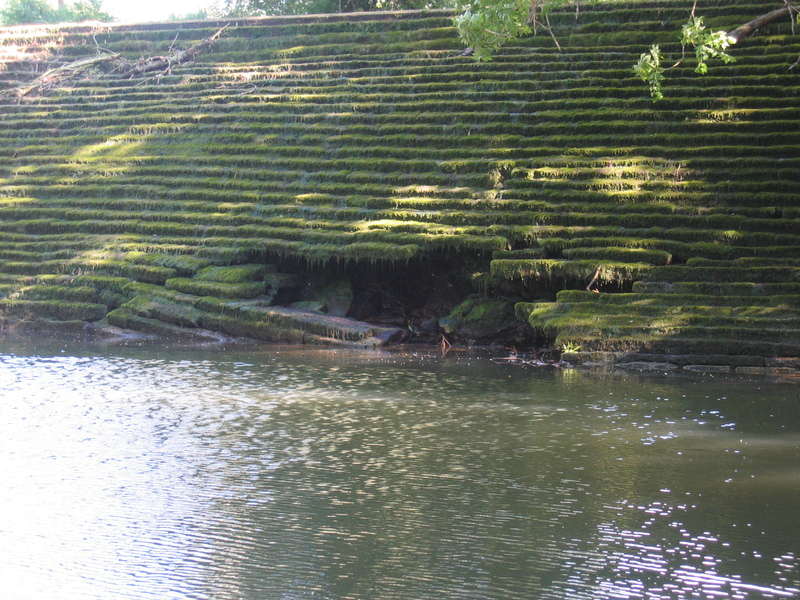 In the 1930’s the Rivers Authority had the weir repaired, and after a partial collpase in the mid 1960’s they had the eastern half of the weir rebuilt, in concrete. Thus it looks as though the weir needs substantial repair approximately every 50 years. The Lydford community is continuing with research into the histoy of the weir and surrounding area, and more will be added to this note as it becomes available. The repair project has been given a grant by Viridor Credits towards the weir repair. This will allow us to start work in 2012. Lydford Weir Company is now a registered company and charity! Lydford Weir Company is now a registered company, limited by guarantee and a registered charity, with Memorandum of Understanding and Articles of Association as required by the Charities Commission. The Lydford Lower Weir is a very ancient structure structure that will originally have been built to create a mill leat to proved the water source to power the mills downstream, both of which still exist, although not as working eater mills; it is mentioned n the Domesday Book. As a result there is a two kilometre stretch of the River Brue upriver, in effect a level millpond, which creates a particularly delightful environment, especially for the church of St Peters which stands by the riverside that is the main place of worship for the residents of Lydford and a popular venue for weddings. This is all much appreciated not only by the local residents but also by the many visitors who come to walk beside the river and by the fishermen from Glaston Manor fishing whose principal beat this is. The weir itself is adjacent to the Forest Garden, itself a registered charity, created by a local person and maintained by local residents with donations and work. The Forest Garden itself is planted with a variety of native fruit trees and hedging plants. It is much used by families for picnics in the summer. The whole ensemble, including the weir, is a haven for many kinds of wildlife, in particular kingfishers and other riverine species, including eels and voles . 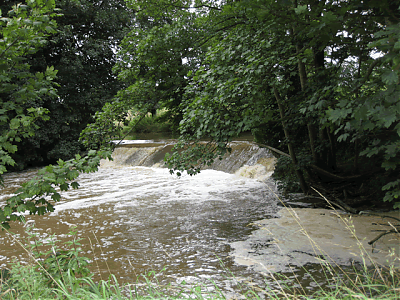 This would all be lost if the weir collapsed, which is regarded as potentially imminent in the case of heavy weather. So the principal purpose of the charity is to maintain the beautiful environment, in the first instance by repairing the weir to ensure its long term integrity and thereafter to continue to maintain and improve the amenity surrounding it. The conservation and improvement of Lydford weir, in Somerset, and its surrounding habitats, wildlife, flora and fauna for the benefit of the public. Why does the weir need repairing? September 2010; Village group present to Parish Council and Lydford Weir Repair Group is formed. October 2010; Historical search tried to access church records but these are in transit from Wells to Taunton. In negotiation with King o Mill to access very old mill ownership documents.